Designs by Lisa Somerville: Mono Printing - SDC#48 and a Giveaway! Mono Printing - SDC#48 and a Giveaway! I've often admired the fab backgrounds that Kate Crane incorporates into her artwork, and this weeks Stampotique Challenge was the perfect time to give it a go! Inspired by this piece of Kate's, I set out to create my background using the Gelli Arts Plate, Claudine Hellmuth Studio Paint, some Punchanella and a Chicken Wire Stencil. Because I wanted to add color to the stamped image (as shown above), I stamped and masked the image on watercolor paper, before I added the Mono Printing using the Gelli Arts Plate. Here's a picture of how the project looked, once I removed my masked image and added the Mono Printing. A few weeks ago, I became the 400th Friend of Gelli Arts on Facebook, and Lou Ann graciously offered me a 6" x 6" Gelli Arts Plate to giveaway to one of my readers! 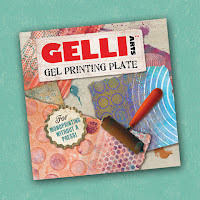 To be eligible to win the Gelli Arts Plate, simply leave a comment on this blog post by Saturday, February 18th. I'll randomly draw a winner from all comments left on this post and post the winner on Sunday February 19th. Be sure to check back to see if you are the lucky winner! Oh that's just too cool! Endless background possibilites! Love it! 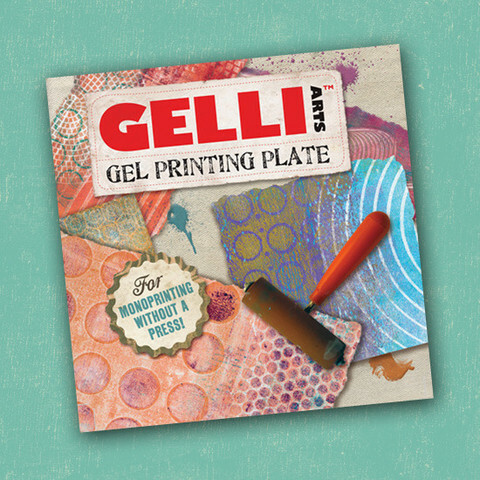 I would love to win the Gelli Arts plate it's fabulous!!! Wonderful effect! love the background and it works perfectly with your stampotique gal! 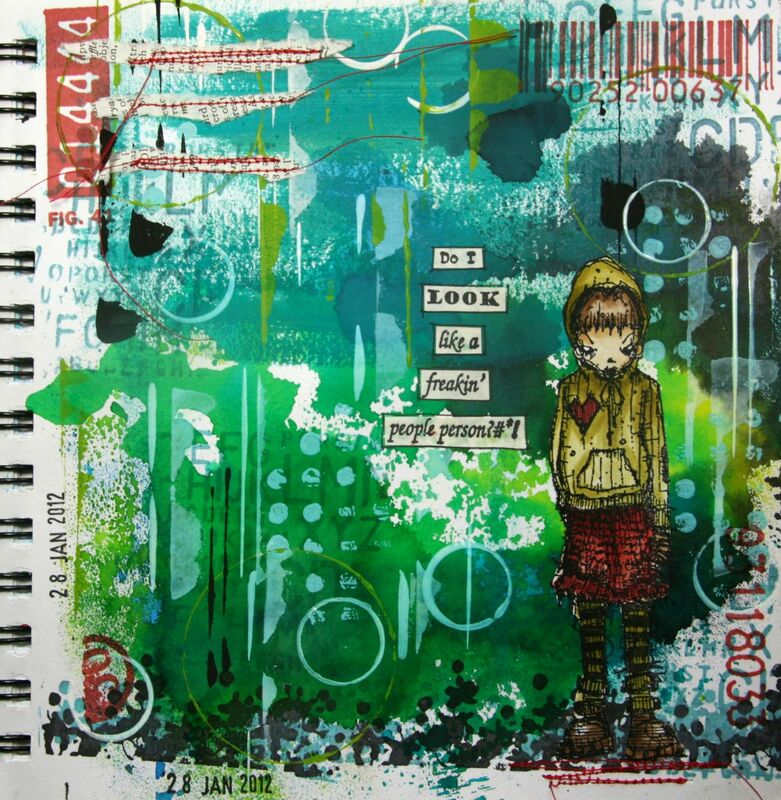 Have no idea how to use a Gelli plate but it looks interesting! I took a mixed media class at the CHA, and would SO LOVE to win this so I can try some things!!!ThankS!!!!!! Your card looks wonderful, great background. Love the image. Thanks for the chance to win your giveaway. That is so cool, and drop dead georgeous, I love it!! I am filled with excitment over this gelli plate. I love the effects that you have acheived on paper and can only envision more ideas!!! Holy cow...I have never seen this 'Kate Crane' side of you! I love it!!! Fantastic color and background is amazing! I need to get my hands in this...I need more time!!! Fabulous work! Awesome background, Lisa! This is so up my alley! Well since February 18th is by DD's B-day, maybe I will be lucky! Happy Sunday! What a fun background! It looks like a very interesting technique. I'll have to check out the Gelli Arts facebook page. Awesome background for this wonderful card, Lisa!! Thank you so much for sharing your inspired art with us at the Stampotique Designer's Challenge this week! Wow - this is so cool! Love the background. The image and words go together so well! Your background looks amazing Lisa, and love the card-one of my favorite sentiments. Thanks for joining us at Stampotique Designer's Challenge this week :-) and thanks for the help today! girl that background is amazing. I love it! I just love how you created this card. So much dimension and color to it. Love all your work! Thanks for the opportunity to win! Lisa, this card/background is awesome. You find some of the coolest items to play with. I'm in awe of what you create. Love what you have created. That gel plate looks awesome! Would love to get one. Wonderful background and wonderful CASE, Lisa! Thanks for joining us at SDC # 48. I love the gel plate, I've never heard of it before. This is soooo Kate Crane. The whole project looks wonderful, you rocked it! I have no idea what the gel plate thingy is, but you know I'm always up to try anything so I'd love to win it!! This books looks like a lot of fun! I would love to have it because I'm going to start trying out some mixed media projects.THANK YOU! Well aren't you the generous one. Thank you for offering such a great prize. I'd love to play with a new toy. I have all of the goodies to go with it, too. My teacher said this is an easy tool, much easier than making my own. Lisa, your project is awesome!!!! Nice to see you playing iwth us!